Having contractors leaving a finished roofing job with tons of metal debris on your lawn isn’t just annoying but unsafe, too. It can endanger your pets and kids as well as your car tires! 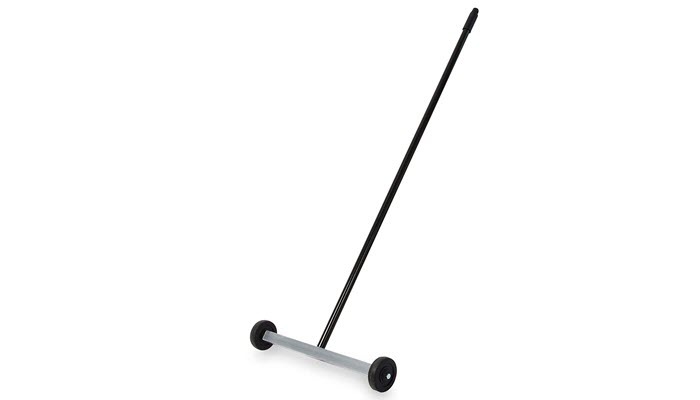 Hiltex 53417 Magnetic Pick Up Sweeper has this really strong magnetic base. 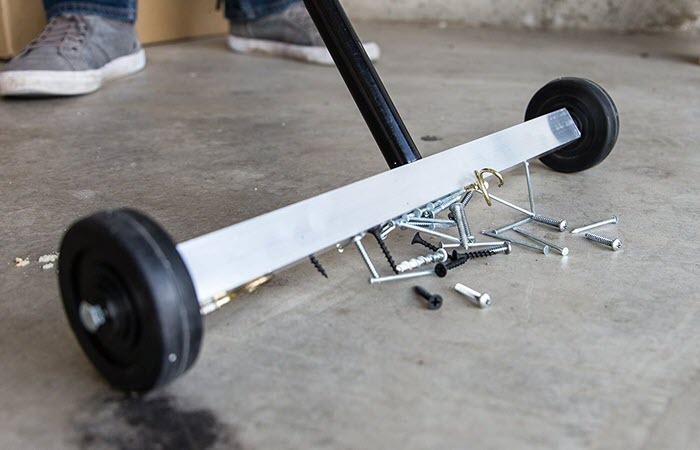 With its rubberized wheels, you can roll it over surfaces to pick up metal screws, shavings, and nails. 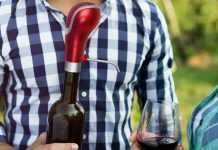 Its handle is rubberized so you won’t really have a hard time using it. It’s designed to provide a comfortable yet secure grip to minimize hand fatigue. Its wheels, on the other hand, are easy to roll. You can use this tool over your driveway or flower beds with ease. When it comes to cons, one the things you might not like about this magnetic sweeper is its handle. It’s a bit short which can be a problem if you’re trying to get nails and metal bits under tables and other tight areas. The wheels are also not that large. Empire Level 27059 Magnetic Clean Sweep, on the other hand, comes with a 11.5 inch-wide magnetic head. It’s big enough to lift small machined parts, nuts, bolts, nails, and screws. And to make it even more efficient in doing its job, this magnetic sweeper actually comes with an adjustable angle magnetic head. Its shaft extends to about 40 inches, giving you more length when reaching under tables and tight spaces. Its wheels, on the other hand, measure about 3 to 4 inches across. It works really well on most flat surfaces, including grass. Now, one of the things you need to be careful about when using this product is the push button that sets the angle of the handle to the magnetic bar. It’s a bit flimsy and can easily pop out if you carelessly run it over uneven surfaces. 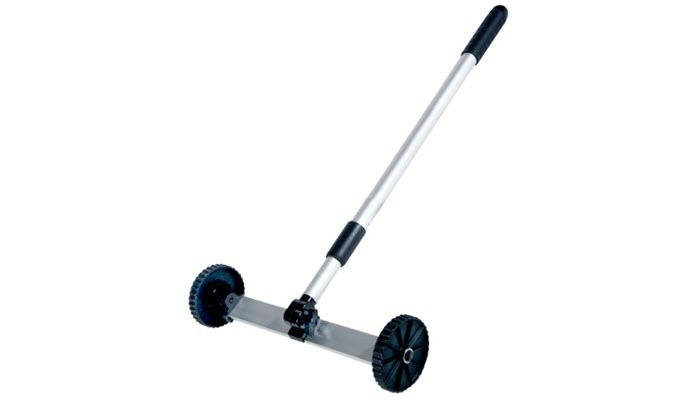 Master Magnetics – Magnetic Sweeper with Wheels is made with lightweight materials. This helps make sure that you don’t get easily exhausted when using the tool. 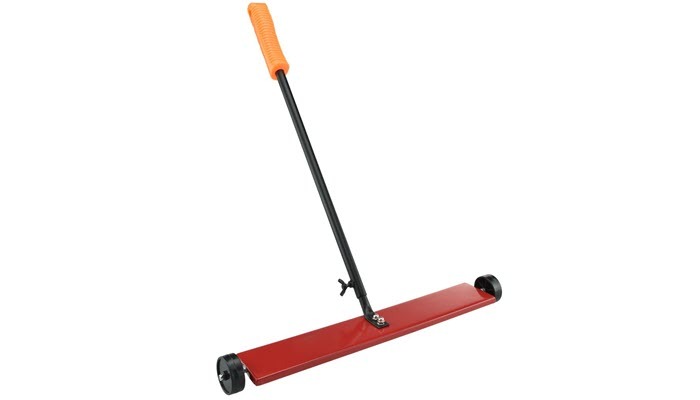 You can certainly push and pull it on surfaces and across floors, driveways, and grass without the need to exert too much effort. Compared with the previous product, this magnetic sweeper has a wider base that measures 14.5 inches. It’s capable of collecting about 1.6 lbs of metal at a time. When it comes to the wheels, they are side-mounted with rubber treads and steel bushings. These materials make the tool easy to maneuver whether you are inside your home or outside your yard. The magnet is protected by aluminum housing designed to resist corrosion. You can use it anywhere without having to worry about it getting damaged or rusty quickly. For our budget pick, we chose GRIP 53417 17″ Mini Magnetic Floor Sweeper. 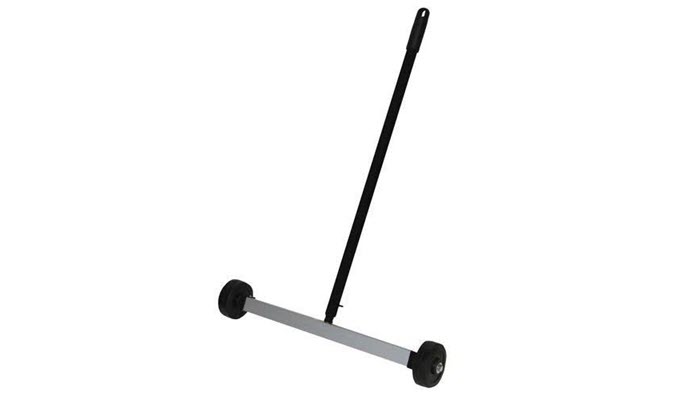 This one has a telescopic handle that can extend from 23 inches to 40 inches. That’s a lot if you are looking for length. Its sweeper is wide as well. Measuring 17 inches, it should be able to reduce your cleanup time. And as for capacity, this one can lift about 4.5 lbs. Take note that the sweeper still has its limitations. Although the magnet is powerful, it can’t pick up nails that are embedded in dirt. You may need to pass the sweeper multiple times before you can get the nails. In this category, we chose to stick to push magnetic sweepers as they are more ideal to use at home and shops, particularly if you have small spaces where you tend to accumulate pieces of metal from your projects. You can do this by turning the handle clockwise. This would enable you to pull out the handle to the required height. Once you are able to achieve that, you can turn it anti-clockwise to secure. To start picking up debris, you need to roll the push magnetic sweeper along the ground. Be careful and go slowly to really pick up the pieces. Metal debris and nails that are embedded may take more time and effort to pick up. Get a piece of cardboard onto a flat surface and roll the sweeper onto it until it has dropped every material it has collected. For that, you need to use the release system of your sweeper. If there are still pieces left on the magnet, you can use a wire brush to carefully brush off the remaining materials. There are 2 types of release system so it’s best to be familiar with your tool first before using it. For collar release systems, you can pull the collar in the direction of the end of the magnetic sweeper. To re-use the tool, you just let go of it. For a handle release system, pull the handle towards the magnetic sweeper’s handle to turn off the tool for a moment. Release to turn the unit back on. Getting the best manual sweeper can help you minimize accidents at home. It can also save you time from manually picking nails and metal bits after your project. 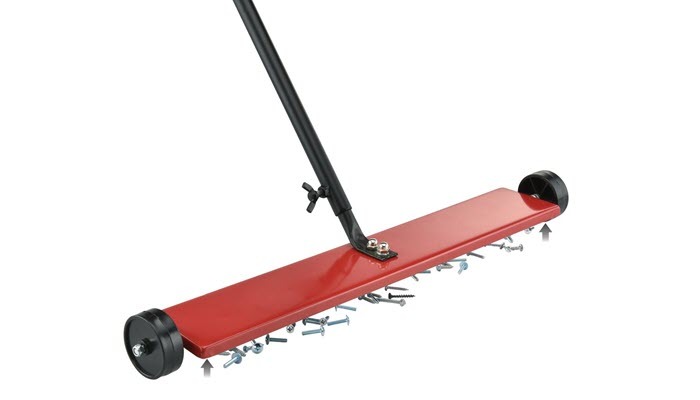 For us, the best magnetic sweeper is the Hiltex 53417 Magnetic Pick Up Sweeper. This one has a really strong metal base that can help you pick up metal screws, nails, and shavings faster, safer, and easier. The tool is easy to roll and goes really well on most surfaces. You can even use it over your flower beds. To make cleaning up faster after your DIY project, consider getting a dust extractor, too. We have a list of reliable products you might want to check. And to complete your tools, invest in the best tool box set.